The Supper Protein Wire Model Bender, also known as Byron’s Bender, will make one-piece protein alpha-carbon models. The Supper Protein Wire Model Bender is a device for easily making α-carbon backbone models of protein molecules by putting the appropriate bends in a single continuous length of steel rod. The models can be made at any scale down to about 4mm/Å. At that size models can be completely free-standing, so that there is no need for a network of extraneous supports. They are small enough to require very little storage space, and sturdy enough to survive frequent handling and study. Several good types of protein models are already available, but they all involve accurately joining together a great many small pieces, so that the expense and difficulty of construction has limited their use. Fortunately, the simple one-piece protein models produced by the bender can serve many of the functions for which three-dimensional models are most valuable. They demonstrate with unusual clarity the overall folding pattern of each protein, and are especially suitable for comparing regions of similar structure within one molecule or between homologous proteins. With ligands and a few selected side chains added to the backbone, these models show the three-dimensional geometry of enzyme active sites, which is often useful in the design of biochemical experiments. These backbone models are useful for teaching purposes, either as classroom exhibits or as a laboratory exercise in which students make their own protein models to study and keep. Since these models are small and can be constructed rapidly, it is practical to build models of each of the known protein structures. The bender was developed by Byron H. Rubin and Jane S. Richardson at Duke University (with support from The National Institutes of Health, Grant GM 15000). 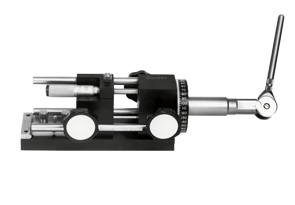 The rod is bent through a bend angle Bn which is read on the bend hammer dial, with a slight amount of overshoot to allow for the elasticity of the steel rod. To assure instrument longevity, the bending anvil and hammer, as well as other parts subject to stress, have been hardened to Rockwell 45. Explanatory material is provided with each bender when shipped. The process of bending models is described in detail. Lists of bending angles are included for ten proteins (Insulin, Rubredoxin, Trypsin Inhibitor, High-Potential Iron Protein, Cytochrome b5, Cytochrome C, Carp Myogen, Staphylococcal Nuclease, Carbonic Anhydrase, and Lactate Dehydrogenase), and literature references are given for those sets of protein coordinates which have been published as of May 1972.